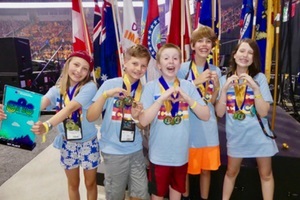 In May, more than 1,400 Destination Imagination (DI) teams from 19 countries gathered in Knoxville, Tennessee to participate in Global Finals—the world’s largest celebration of creativity and the culminating event of every DI season. 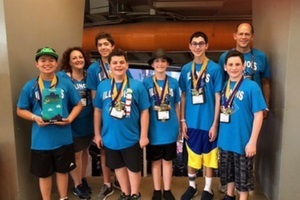 Teams at Global Finals had the opportunity to showcase their solutions to one of six STEAM-based (science, technology, engineering, arts and mathematics) Challenges, which they worked on for several months prior. In addition to showcasing their innovative solutions on the international stage, teams that attended Global Finals had the opportunity to interact with students from around the world, learn about innovative technology from industry experts such as NASA, Space Camp, Oracle Academy, and more, and strengthen their 21st century skills through hands-on workshops. For the Technical Challenge, teams had to design and build a device to navigate a tournament-provided maze. Teams had to design and build a prop that transforms in the maze, as well as design and build a way to remove an object from the maze. In addition, teams had to create and present a story about a journey through the maze, as well as create and present two Team Choice Elements that showed off their interests, skills, areas of strength, and talents. 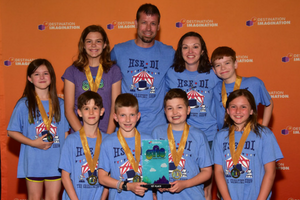 Team Members: Gabe H., Tate W., Owen P., Elizabeth, B., Claire L., Delaney G., and AJ K.
Synopsis: The DInsteins story took you into the lives of four scientists and three explorers that were faced with a task of saving the ocean. The four scientists were keepers of a magical orb that played an important part of the ocean’s ecosystem. However, one of the scientists turns evil and steals the orb with plans to destroy the ocean and its inhabitants. He drops the poisoned orb into the ocean, and the entire ecosystem begins to die. Panicked, the three remaining scientists call in their explorer friends to retrieve the orb and save the ocean. The scientists gave the explorers a Maze Traveler, called HO2, to help them navigate through the ocean and find the orb. The Maze Traveler utilized geared DC motors with encoders to create an autonomous vehicle that would navigate the randomly selected maze utilizing an Arduino and coding. The encoders allowed the teams to count “ticks” that were generated as the magnetic polarity changed as the disc spun on the output shaft of the DC motor. This not only allowed the team to code the traveler to drive a specific number of “ticks” to navigate but also allowed them to adjust the speed of each motor to keep the traveler driving straight. The team also constructed a hydraulic arm that lifted the teams object onto HO2, and remove it from the maze. The hydraulic arm was critical to saving the orb because the explorers couldn’t touch the orb or they would go BOOM! The team utilized syringes, tubing, wood, and a neodymium magnet. The hydraulic arm, which had five points of articulation, was used to load the poisoned orb onto the HO2 and remove it from the maze. For their prop transformation, the team constructed a scissor lift using a threaded rod. When spun by a cordless drill, it raised the lift and exposed the living coral scene that was a team choice element. The team utilized spray foam, cardboard tubes, pool noodles, toothpicks, floral mesh, and modeling clay to create the coral, fish, sea urchins and an underwater scene. Finally, the team constructed an underwater backdrop as their other Team Choice Element that utilized another Arduino and over 500 LEDs that were individually soldered to create a moving ocean wave and multiple fish swimming across the board. When the performance started, the ocean was moving and the fish were swimming across the board; however, as the evil scientist poisoned the ocean, all the fish disappear. Thankfully, the explorers save the orb, and all the ocean comes back to life and the fish are back! Team Members: Audrey S., Billie A., Cassie S., Jake B. and Kristin C.
Synopsis: “Once upon a time there was a DI team made up of four drop-dead gorgeous girls and the dude… Who writes this stuff?” The team is in a junk shop looking for things they could use to solve this year’s Challenge. As the team is looking around, they discover a hidden door. he door isn’t working properly because a gear is broken, so when some of the team members enter through the door, they come back out as crazy characters! The last remaining team member asks the Junk Bunny if it could help find a way to change her friends back. The Junk Bunny goes on a journey through the junk shop to find something to fix the door and change back her friends. The Maze Traveler (a.k.a. Junk Bunny) was a fully autonomous robot that was able to accurately traverse the maze. Powered by an Arduino microcontroller that was programmed in C, it used servomotors to move. A gyro sensor was used to make accurate turns and to drive in a straight line. Additionally, three distance sensors were used to see the distances to the walls and enabled the traveler to make adjustment as needed. The Prop Transformation was a wall full of costume pieces in the basement of the junk shop. When someone turns on the light switch, the wall of costumes opens revealing a hidden door. This transformation also causes the wall of costumes to go to the other side of the door and creating a changing room for the characters. The hidden door was decorated with gears that were hand cut and unique. Object Removal was achieved with a second Arduino connected to a distance sensor and servomotors. When the Junk Bunny was detected to be in the event square by the distance sensor, the servomotors were used to drop a gear onto Junk Bunny’s back. Rare earth magnets caught the gear and kept it from falling while traveling out of the maze. For Team Choice Elements, the team created an 8’ x 6’ wall of junk with a kaleidoscope of broken items and obsolete technological gadgets. The team also made paper-mâché costumes and props for each of their crazy characters. 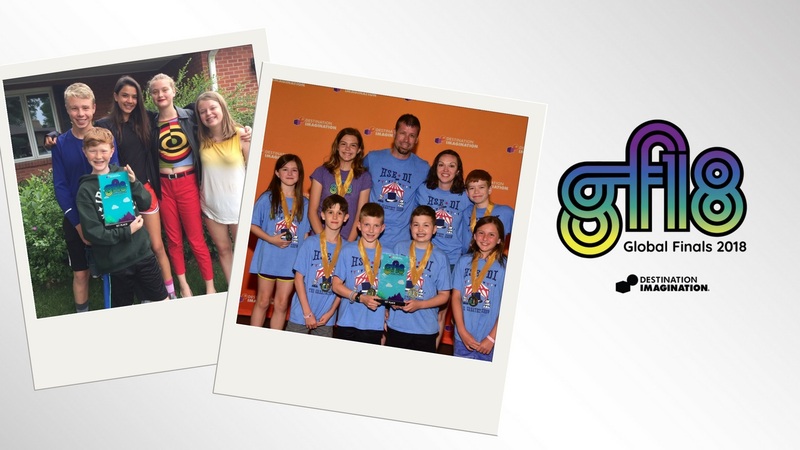 2018 was the Little Neon Monsters sixth trip to Global Finals. The same team sign has been used for every trip. Team Members: Korbin A., Virginia P., Collin B., Isaak R. Meredith H., Matthew C.
For our Challenge, Maze Craze, we decided to put on a fun pirate-themed skit about five ordinary people who decide to go in search of treasure. Along the way, they are stopped by Captain Redbeard and have to outsmart him on multiple occasions. Eventually, they find the treasure and learn that the greatest treasure of all was indeed their friendship. For the technical aspects, we made our own robot to follow the maze. Instead of remote-controlling the robot, it solved the maze autonomously. We laid down Aruco markers (like QR codes) in the maze labeling where the walls were and had a camera overhead read them. A program we made then figured out a path through the maze and sent it back to the robot to follow. This was all made possible with a raspberry pi, coding in python and a python library called OpenCV that detected the Aruco markers. Some other fun things we did was have a prop that changed LED color triggered by a tilt switch when we flipped it. We made Captain Redbeard’s coat out of recycled plastic and coffee filters we died with Kool-Aid. We also learned to play the ukulele and wrote an original song that started and ended our skit. We are so excited that we won and want to give a big shout out to all our sponsors, especially Abilene Christian University. Thanks! For the Scientific Challenge, teams explored scientific concepts used in amusement park attractions and then used their research to design and build an attraction that used scientific concepts during its operation. Teams had to create and present a story that featured the attraction operating in an unlikely location and portray the unlikely location using sights and sounds. In addition, teams had to create and present two Team Choice Elements that showed off their interests, skills, areas of strength, and talents. The Story: Subjectively Objective told the story of three Vikings setting off on a journey to reclaim their honor after suffering defeat in their village’s rap battle. Just off the coast of Norway, they encounter the Norse god Loki who has been chained to a rock by Odin in an effort to prevent Loki from triggering Ragnorak (the destruction of the nine worlds). With the help of his son Fenris, Loki has stolen Odin’s Midgard Midway, the games of chance and skill Odin uses to test warriors’ Valhalla-worthiness. Loki has rigged the games and plans to use them to trick the Vikings into freeing him from the Rock. As the Vikings rap their way through the playing of each game, the rock begins to crack and Loki’s chains are broken one by one. Finally, Loki is freed, but the Vikings are able to stop him with their transforming Viking ship. The Attraction: This team created a midway as their attraction with three games of skill and chance. The first game, Thor’s strength test, was a hammer game using pneumatics, electricity and computer-programmed lights and buzzer. The second game, Njord’s Magic maze, featured a hand-crafted wooden maze mounted on a Lazy Wusan that turned so the player could try to navigate a ball through it. The final game, Wheel of Midgard, was a traditional wheel of fortune game with a twist. Using a team built electro-magnet, Loki and Fenris could make the wheel stop on the losing space every time. The Unlikely Location: To visually represent the rock in the ocean off the coast of Norway, the team built a mechanical rolling ocean out of wood, PVC and cardboard, with 21 waves that bobbed up and down, and a large tidal wave that rose up from the back. They also built a giant rock chair with sides that could come crashing down as Loki freed himself. Above the rock chair, clouds mounted on a mechanical mobile moved across the sky and an oversized thundercloud with a retractable, folding lightning bolt hovered. To create the sounds of their location, the team wrote three original songs based on Norse folk music, and one original piece of carnival music. They also created several Foley-sound stage inspired devices to replicate the sounds of wind, thunder, waves, tidal waves, rocks cracking, chains breaking and an earthquake. Team-Choice Elements: This team created a Viking ship mounted on a rolling seesaw with a dragon head that came to life and a hidden battle horn. They also made a ticket machine that looked like a seagull sitting on a rock that dispensed tickets out of the seagull’s mouth whenever a Viking won a game. Team Members: Preeti B., Joshua D., Rebecca G., Lindsey H., Taha K., Kevin O., Patrick O.
Synopsis: What a finish for these seven seniors! 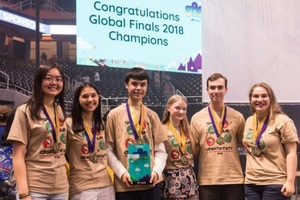 Not only did they capture a first-place finish at DI Global Finals, they all hurried home to march in their high school graduation ceremony. This team has been together for three years, but several of the team have been doing DI since second grade. 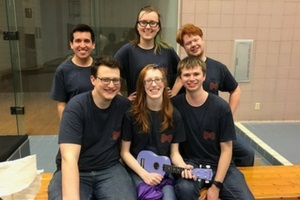 For their final year competing in DI, the team went way above – and far below – with their creativity. So far below they ended up in the Catacombs underneath Paris – full of bones, skulls, eerie noises, and a singing skeleton quartet. One day, while delivering milk to the inhabitants of the Catacombs (bones need calcium after all! ), a milkman and his apprentice stumble upon a daunting figure – a necromancer raising the dead. This scares the milkmen, but they are brave and vow to stop the evil. The young apprentice hurries to the princesses to summon some help. The princesses are all too eager to assist (maybe a little too eager!). They lead the apprentice to their secret laboratory, where it just so happens they have been working on a secret attraction which will stop the evil. The mad scientist has been creating this attraction deep in the Catacombs – it is a PINK PEGASUS (how unlikely!). The princesses need the apprentice to activate the Pegasus to unleash their plan. Little does the apprentice know, but the real evildoer isn’t the necromancer after all – it’s the princesses! Once the Pegasus spins and twirls, it unleashes its power to turn all the Catacombs into everyone’s least favorite colors – pink and purple! Walls turn pink, bones turn purple, and skulls come to life with spooky, blinking eyes. The princesses now have the power of the whole land. It is now up to an unlikely group of milkmen, a mad scientist, a skeleton king, and a necromancer to stop the princesses. Over their living bodies will the princesses turn the Catacombs into such an atrocity full of color. Once the princesses are defeated, the heroes turn the Catacombs back into what they once were and everyone lives happily ever after! To portray their location, the team sculpted hundreds of bones and skulls from paper mache and carefully painted them by hand to have the appearance of real bones. When the skulls turned pink and purple, the eyes blinked and came alive by using team-coded and wired lights that were a Team Choice Element. The Catacombs were brought to life by the eerie sounds that are heard – bones cracking and rattling, thunder, wind howling. The sounds were made by a team created sound machine made completely of common items – water bottles, nails, aluminum, beads and egg cartons. Their attraction, the Pink Pegasus, was created by building a structure out of chicken wire and recycled materials (milk jugs, cereal boxes, plastic soda bottles, etc.). They spent hours molding the body to find the exact proportions and also used paper mache around the entire body. The Pegasus spins by a motor and gears that the team crafted and wired themselves. The singing barbershop skeleton quartet puppets were not only one of the team’s Team Choice Elements, they were a constant comic relief and had everyone singing along. Watch the team’s performance here. 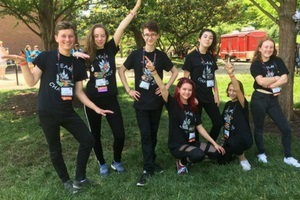 For the Fine Arts Challenge, teams had to create and present a musical that included a change in plans, as well as music and lyrics that enhanced the storytelling. Teams also used technical methods to create a spectacle that was included in their presentation. They also had to design and integrate a set change, as well as create and present two Team Choice Elements that showed off their interests, skills, areas of strength, and talents. Team Members: Ainsley E., Brady R., Eva J., Jenna J., Pearson U., Georli V., Chloe T.
Synopsis: The Burritos told the story of the backbone of so many classic fairytales: the woodland creatures. Their performance started with happy music blaring from a speaker while the team sang two different verses simultaneously, all while they quickly set the stage with a bright forest backdrop, as well as a large tree made of duct tape, cardboard and paint swatches set on a spinning base. One of the trees in the backdrop had a secret opening, allowing the narrator to set the scene. A fluffy bunny hopped onto the stage, where she made three new friends in a fox, a deer, and an owl. They joined together to sing one of many completely original songs featured in the performance. The four animals made clear their intentions to find a princess and get her to the ball. Instead of a princess, though, they found a photographer, a DJ and a lumberjack. They animals sang their next song, which described their growing frustration with their unsuccessful quest to find a princess. Finally, a prince came to the stage, but it was actually just a kid playing dress up. The animals left the stage as the prince sang a melancholy song about feeling rejected. Between the two acts, a dark, spooky scene with lit-up eyes for owls and trees was quickly lifted over the bright forest, accompanied by creepy, original sound effects and black streamers coming from behind the backdrop. The animals returned with dark makeup and costume changes to enhance the angry mood, spinning the bright tree around its access to show a dark tree with ominous red apples. The whole change was highlighted by an original rap, complete with a recorded track of the team playing instruments and singing background vocals. Synopsis: “Happy Town” the musical tells the story of why it is important to be yourself. As the show opens, “once on a bright Sunday morning…,” we find a wizard who attempts to create the perfect community. He quickly discovers that the town was too perfect, and all of the townspeople become clones of each other (portrayed as team-built hand and rod puppets, earning top Team Choice Elements honors). The wizard sent in a boy to help them discover their true selves. However, when the boy starts to do the same things as the puppets, the wizard realizes he has to change his plans. He summons a tornado, which destroys the town and forces the townspeople to confront their authentic, unique identities. Through an extended song sequence, the townspeople build distinctive homes to represent their individual interests and then through shadow play and digital effects transform from puppets into humans – becoming their own true selves. This team of sixth-graders enjoyed researching the process of crafting a musical. After writing a spoken script, they identified sections to turn into lyrics. Adding simple, but memorable tunes to the lyrics, the songs of “Happy Town” came to life with a variety of accompaniment ranging from piano to saxophone to household items. The team wrote and scored all of the show’s music. While the team will always remember their winning moment, they are also proud that three local Knoxville moms approached them after their performance to ask if they could keep the houses. Although the team was looking forward to the typical post-performance dumpster party, they will cherish knowing that their craftsmanship endures to serve as playhouses for young children. Team Members: Jess B., Erin B., James P., and Adamson N.
Synopsis: Bringing the grandeur of Broadway to the stage through a stunning musical score and complex set pieces, the team captures the strong emotions of grief and loss and creates a vivid depiction of a lone lighthouse on the forested coast. Struck by the grief of the death of her parents, Aaleiyah plans to leave the only place she’s ever known: her home. Her past haunts her, leaving her lost and alone. Struggling to break free, she meets the lighthouse keeper, Henry Blake, who lost his daughter long ago. Together, they embark on a journey to conquer their pasts and unite together as a family. Aaleiyah then changes her plans to stay—she breaks free from her past ready to move on. A lost father and a lost daughter brought together by the light. With over 1,600 man hours put into their Challenge, DIdeas Keep On Comin’ wrote six original, fully-orchestrated songs featuring recurring themes that connect the entire musical together. Built upon complex rhythmic patterns and musical qualities, the team used their songs to capture the darkness, emotion, and even the hope that the story so heavily relies on. Ending the first act, the Set Change is designed to be an expression of Aaleiyah’s memory of the traumatizing fire that took her parents. This idea is achieved by the transformation of the trees on the set, which all, in unison, reveal their ashy, charred figures, as well as a house frame that rises up from the ashes, before collapsing into the campfire below, revealed by the snowy terrain as it opens up. The Set Change uses several technical methods, and is designed using complex pulley systems which allow the trees to rotate on their axis, enable the house to rise up and then collapse down, and open and close the terrain to reveal the campfire. There are 10 pulleys which control all of these motions during the Set Change, taking coordination and timing to precisely control these actions. Sound effects are used to heighten the tension and effect, as well as the music beneath. With the foundation of soliloquy and costuming, the Spectacle is the pinnacle of Aaleiyah’s story. The soliloquy, with its intense overflow of emotion, guides the audience to get a sense of the pain that Aaleiyah has gone through, and her fight for freedom from her past. This poetry creates the theatrics, and combined with the costuming, they enhance and create the drama of the entire spectacle, making it memorable and impactful. The costuming builds on the vivid poetry of the soliloquy, bringing a visual element to the flowing words. They act as a visual representation of all the pain and struggle that Aaleiyah has gone through, and serve as a reminder of why we must move on in life. DIdeas Keep On Comin’ Team Choice Elements include their red-and-white striped lighthouse, with the red-roofed house adjoining. This set piece was inspired by historic blueprints of lighthouses, specifically Alki Point Lighthouse in Washington. The structure features a complex system of cables which allow the set piece to reveal the house inside. The piece also houses all of the audio equipment to run the music cues and sound effects. The team also spent countless hours designing and constructing their Wagon Revolve, a large track system with a gliding platform that doubles as a turntable. The system is complex and intricate, taking inspiration from the grandeur of the Broadway stage. It houses a pulley system that allows the travel of the platform back-and-forth on the track, emphasizing the depth of the set. This allows for dynamic separation, symbolizing the ebbs and flows of the relationships between the characters. This piece uses a team-crafted wheel, driven by an axle that runs the length of the track, enabling the turntable to revolve. DIdeas Keep On Comin’ has been a team for four years, putting countless hours into the creative process in bringing stories to life. 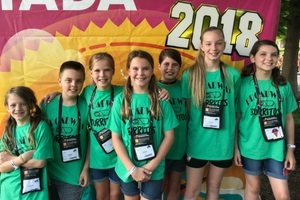 Their wonderful time at Global Finals 2018 was truly a celebration of their hard work. For the Improvisational Challenge, teams had to research different cultures and famous explorers. At their tournament, they had to create and present an improvisational skit about a quest to return a lost cultural treasure to its owner, as well as integrate two explorers and a prop into the quest. In addition, teams had to show how characters work together to overcome a setback. Team Name: Non-Fat, Extra-Hot, No Whip!! 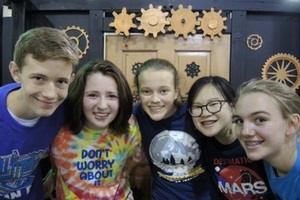 Team Members: Ben V., Analia M., Kinsley P., Shlok K., Rohin Q., Lincoln J., and Nadia A.
Synopsis: Jacques Cousteau and Howard Carter find themselves in an antique shop. That alone is enough of a premise for an incredible adventure. But wait – there is more! Their mission, should they choose to accept it- return the didgeridoo to the Aboriginal people! The members of this team worked together to begin the journey to ensure the “Treasure” was returned to its rightful owners. Then, all of a sudden… a setback: the camels were on the loose! Within seconds, our team decided to utilize their handy Prop-in-Motion to help discover some saddles to gain control of those rascally camels. In the end, the Aboriginal people had their didgeridoo thanks to Jacques, Howard and their crew. 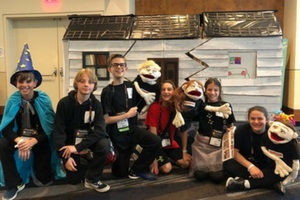 Team Members: Lily W., Trevor M., Alli J., Milana R., Braden F.
Synopsis: Our team spent countless hours researching various explorers both real and fictional and practicing depicting those explorers in improv skits. We also researched cultural treasures that we thought would be interesting to include in skits. In fact, we picked Stan Lee and Bill Nye as two of our treasures because we thought they would be fun and unique to portray. We learned to be creative and think fast on our feet to solve multifaceted problems. We got really imaginative with our use of the sheet and also practiced hundreds of setbacks and unusual places. We felt that we could integrate anything into our skits in imaginative ways. Throughout the season we learned about teamwork – about how we share the success when things go right and share the blame when things don’t go as planned. From Ann Bancroft, we learned that in reaching for our goals things don’t necessarily go the way we planned, but that is okay because the joy in life comes from the journey rather than where we end up. From Leland Melvin, we learned about the importance of second chances. From Elon Musk, we learned about taking risks and thinking big. Most of us have been together as a team for six years. We took pride in having a great improv team, but our performance at Global Finals didn’t meet the expectations that we set for ourselves. However, we had also been practicing Instant Challenge all year long and we learned a great deal about engineering. We built bridges, towers, boats, and all kinds of picker-uppers. Instant Challenge had been our downfall at Global Finals before. Ironically, it was the Instant Challenge in which we excelled this year. This reinforced what we learned from Ann Bancroft – that sometimes you don’t achieve your dreams in the way you envisioned. Our experience with DI also showed us that big payoffs can take years of hard work, preparation and perseverance. Synopsis: The missing treasure drawn for Global Finals was the Mayan Calendar. The Explorers were Ann Bancroft, who brought her team of sled dogs, and Pearl Primus, who arrived with her usual enthusiasm for sharing African dance. The unusual location was a Golf Clubhouse. Just when the explorers got to the bottom of the problem, figuring out that the Golf Club manager was using the calendar to keep the golf course a beautiful green while the rest of the land suffered, the setback was drawn. Suddenly things got worse as pigeons began mistaking them all for statues. Of course with Ann Bancroft’s ability to communicate with animals, all was dealt with in the nick of time and with the return of the calendar, the Mayan people and their lands were able to go back to normal. All thanks to the problem-solving skills of the explorers! For the Engineering Challenge, teams had to design, build and test a freestanding structure that could withstand impacts from dropped weights. Teams had to tell a story about a sudden event with a dramatic impact, as well as design and create a visible or audible depiction of the story’s sudden event. In addition, teams had to create and present two Team Choice Elements that showed off their interests, skills, areas of strength, and talents. Team Members: Adam C., Laura C., Mady C., Eric G., Ronya S., Claire W.
Synopsis: After five prior, consecutive Global Finals appearances with finishes of 2nd, 3rd (twice), 4th and 9th place, three Renaissance awards and one Da Vinci award, this graduating team’s final performance had a storybook 1st place and 4th Renaissance Award ending. This team’s story features a misbehaving pet sheep (“Shawn”) and his owner annoying the captain and crew of a nuclear-powered cargo ship. The sheep’s antics lead to the accidental dumping of nuclear waste into the river, spawning the dramatic attack of the ship by the legendary Kraken sea monster. The cargo ship’s backdrop, made of cardboard and wood, has an engine with moving gears and pistons. The engine releases nuclear waste with a hidden pedal using a tension mechanism. The backdrop also displays a portrait of the captain, rolling waves animated by two opposite-spinning corkscrews, and realistic details right down to the painted rust. The Kraken crashes through the backdrop with spring-loaded tentacles. Each tentacle that engulfs the ship implements different, non-electric mechanisms to create movement. One tentacle flails by using hydraulics, a second tentacle thrashes by pulling fishing line tendons, while a third writhes through mechanical gears. Another tentacle grabs a character using strategically placed magnets. The Kraken’s searching and blinking eye has a mechanical oscillating sine wave eyebrow. The anatomically accurate sheep puppet realistically walks through a series of hinged levers. Additional controls flap the ears, open the mouth, and move the head and neck, bringing the sheep to life. The 18.4-gram structure withstood the maximum number of dropped weights, achieving the highest ratio in all grade levels at Global Finals. The graduating team members will be pursuing their education in STEAM fields this fall at Yale, MIT, Pomona, University of Washington, and Cornell. For the Service Learning Challenge, teams had to identify, design, carry out and evaluate a project that addressed a need in a real community. Teams created a live presentation that highlighted the project and the impact it made on the community and had to integrate team-created infographics that included information about the project. Teams created a storage device that transformed as their story of the project unfolded. In addition, teams had to create and present two Team Choice Elements that showed off their interests, skills, areas of strength, and talents. Synopsis: Each year for the past five years, our team has chosen to tackle a different DI Challenge. This year we chose Service Learning, which turned out to be our most difficult task yet. After researching several needs in our community, we decided to try to make a big impact by helping to solve the problem of school kids who can’t afford adequate clothing. Once we delved into this project, we realized that the outcome of the project was far more important than our Challenge solution. We collected and sorted more than 3,000 articles of clothing and hosted additional fundraisers in order to purchase items such as underwear and socks which we couldn’t collect from donations. As fulfilling as this was, we still wanted to create a great story to show what we accomplished in our community service project. For the Challenge, we had to build a Cache Storage Device that would enclose and hide everything that we would use in our presentation. After much brainstorming, we decided to make our Cache Storage Device a robot, and we told our story using the parable of Marvin the Robot whose rusty gears were symbolic of children who don’t have adequate clothing. Marvin gets help through the assistance of Gears to Robots – a metaphor for Clothes to Kids, a nonprofit that provides wardrobes to kids in the Denver area. We spent so much time and effort constructing Marvin and helping the children he represented that it felt like he was an additional member of our team. In creating solutions for other Challenges in past years, we learned many skills that we were able to apply to this Service Learning Challenge. We had already learned how to use circular saws, jig saws, and miter saws, but we expanded our carpentry skills to include the design and construction of wooden gears that we used to build Marvin. It took countless hours to cut the gears with a scroll saw and sand the gears to get them where they would mesh and operate properly. We found creative ways to use spur, pinion and planetary gears in Marvin to make him lifelike and to make him transform from a sad robot into a happy robot with new gears. We even made Marvin transform into a car and drive along and activate an infographic that lit up to show the progress of our clothing drive. One of our other infographics was a fully mechanized gear counter, also made of wooden gears, which depicted the number of families for whom the team provided full wardrobes. This counter required meticulous effort in order for it to count up and down correctly. Again we were able to use our skills from previous scientific and technical challenges to create a drive system using an old battery-powered screwdriver which we had to rewire. We applied other skills learned from prior DI years in one of our Team Choice Elements, a “gear sorting” device. This required a little bit of chemistry, some technical ability, and a lot of solvent welding. We had to rebuild this device several times before we got it right. We even had a spectacular misfire with one of our prototype devices. In our other Team Choice Element, we combined artistic ability with gears to make Marvin’s broken heart, which only healed and came together at the end of our skit when the gears spun in unison. We hoped this would convey how kids feel when they go to Clothes to Kids and are able to pick out clothes for themselves. Our clothing drive brought in more than $13,000 in clothing for Clothes to Kids and helped 142 families provide two weeks of clothing for their children. With Marvin’s help, this turned out to be our most fulfilling DI Challenge. For photos from this year’s event, visit our Global Finals 2018 photo gallery.